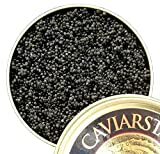 Black caviar is the roe of the sturgeon fish. It is considered a delicacy and eaten as a garnish or spread. 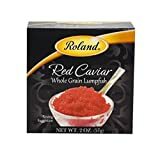 Red caviar is the roe of salmon. It is also considered a delicacy. In Scandinavian cuisine, a version of caviar made from smoked cod roe is eaten. It is known as "smorgaskaviar" or "creamed smoked roe". Lumpfish roe and cod roe are popular in Danish cuisine. In Greek cuisine and Turkish cuisine, taramosalata, a dip, is made from cured carp roe (tarama) with olive oil, lemon juice, and breadcrumbs. A variety of types of roe, are used in Japanese cuisine, some of which are eaten raw in sushi. In some Indian recipes (mainly recipes from West Bengal and Kerala), roe is used as an ingredient. In can be cooked in a variety of different ways including frying, mashing and making into curry, or by wrapping into banana leaves and cooking over charcoal. Serving Suggestion: To be enjoyed directly from the jar, with a touch of lemon and an egg yolk if desired. Mix Caviar with cream cheese and spread on a bagel with lox. 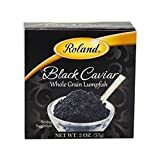 Roland Black Lumpfish Caviar has a firm, crunchy texture with a pronounced salt/fish flavor. Cavi-art with its clean, slightly salty taste, has endless applications. It will add just the right finishing touch to many dishes. Great with canapés and appetizers. 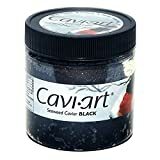 This vegan caviar is made with seaweed. Shelf Life: 4-6 weeks at 26 to 36ºF unopened. For best quality consume within 10 days after opening. Indigenous to the Missouri and Mississippi river areas, these wild American sturgeon are smaller and faster growing than most other sturgeon species, reaching about 38" at full maturity. 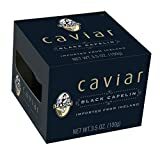 This caviar is appreciated by caviar novices and aficionados alike for its robust taste and dark appearance. The jet-black roe is firm and has a very mild, subtle flavor. Very nice.